I stumbled upon a jackpot during a recent shopping trip at my favorite produce spot. A half peck of avocado “seconds” for $1.25. Absolutely insane. That’s over a dozen of avocados. They were all super ripe and ready to go (although a few didn’t make the cut). First I made a GIANT bowl of guacamole and told everyone to go wild with it. I had more plans – they involved chocolate and avocados. I have a list of avocado recipes to try and hopefully I’ll be able to scratch a few off the list this week. I’m starting off with these Dark Chocolate Avocado Truffles. Me making and tasting this recipe is loooong overdue. Baking and cooking with avocados is a great way to cut out butter and oil. It also adds some awesome nutritional content to your sweets & baked goods – giving you an excuse to eat another piece of that truffle, brownie or cake. “It’s not because I’m a chocolate fanatic, it’s because I need the 20 vitamins and minerals. It’s like my multivitamin”. Sounds legit to me. I’m so loving this recipe. 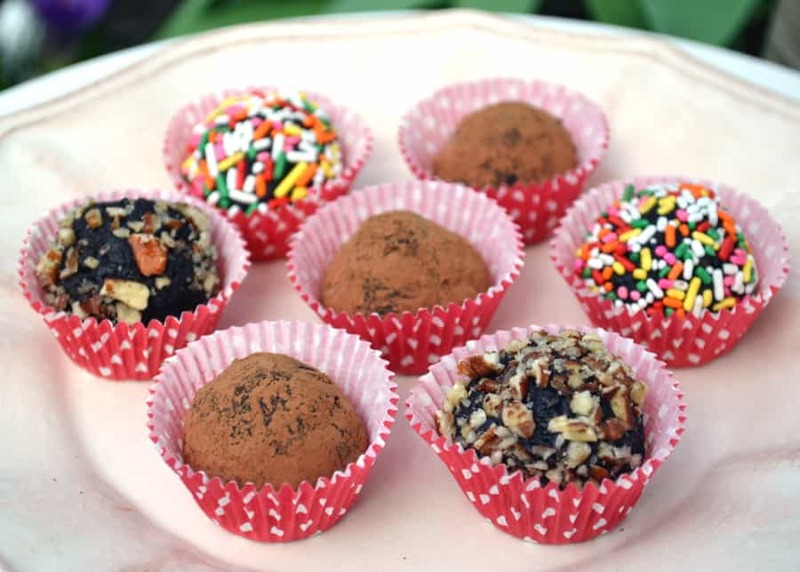 It’s quick, easy and makes over a dozen of gorgeous truffles. Mash the avocado, melt the chocolate, mix everything together and chill in the fridge until mixture has stiffened up a bit. Use a small cookie scoop or tablespoon to scoop out the mixture. Roll into balls with your hands, it’s messy but fun work. Then roll into cocoa powder, crushed nuts, sprinkles – whatever you’d like. I found the avocado taste was very much there right after making the truffles. After letting the truffles sit & the flavors blend for a few hours the avocado taste was gone. 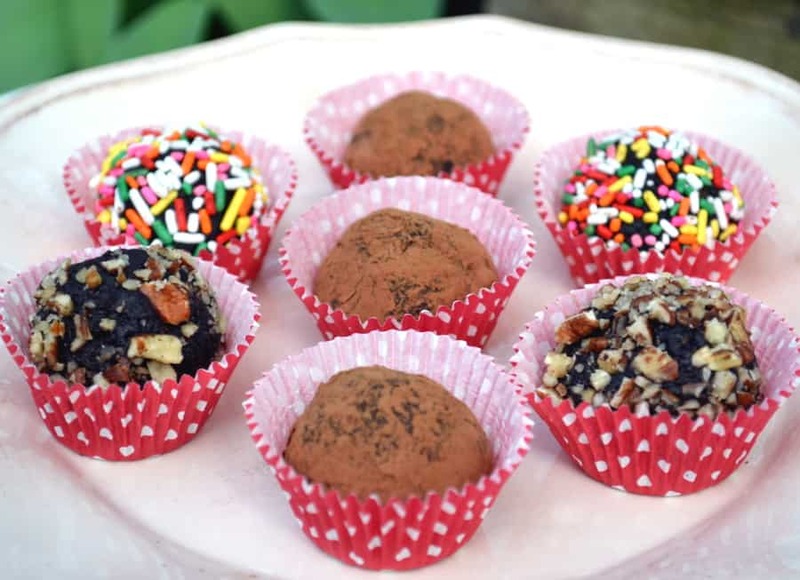 Result – insanely decadent Dark Chocolate Avocado Truffles. You wanna hear something crazy – I think I like these more then the truffles I usually make with heavy whipping cream. 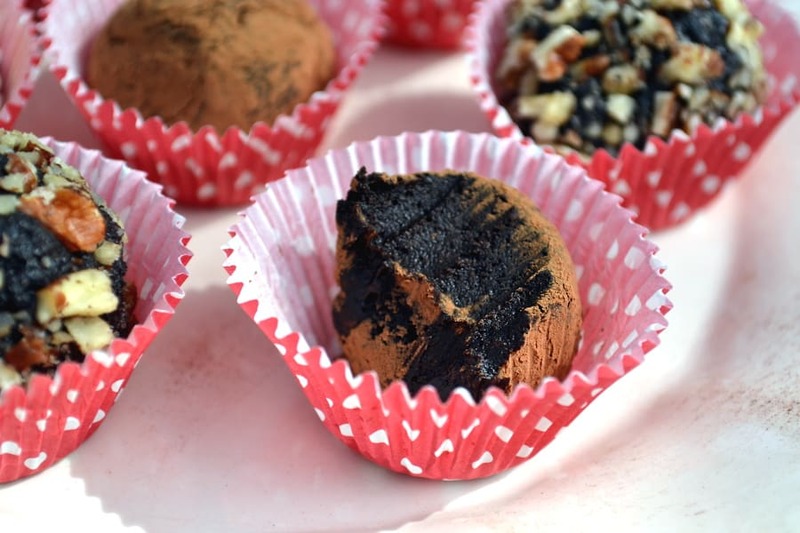 These Dark Chocolate Avocado Truffles are creamier, fudgier and not so melty. And no one will ever guess there’s healthy green stuff in them! Insanely decadent, creamy, fudgie, vegan Dark Chocolate Avocado Truffles. No one will ever guess there's healthy green stuff in them! Peel and pit the avocado. In a bowl, mash the avocado with a fork until smooth and lump free. Melt the chocolate. I do this in the microwave at 50% power at 30 second increments, stirring after every 30 seconds until smooth and melted. Stir in mashed avocado, brown sugar, vanilla extract, salt and 1 1/2 tablespoon of cocoa powder until thoroughly combined. Chill the truffle mixture in the fridge for 1-2 hours or until mixture has stiffened up. Using a small cookie scoop or tablespoon, scoop out truffle mixture. Roll into balls with your hands. 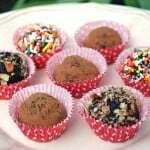 Roll truffles into remaining 1 tablespoon of cocoa powder or any other desired coatings. How much cocoa? It says 2 1/2 unsweetened cocoa… 2 1/2 cups? Tablespoons?? how long will this stay good out of the fridge would it fall apart if not kept cold? Hi Anuradha. I’m really not sure how long these can stay out of the fridge. They’re of best taste and consistency when stored and served cold. They wouldn’t fall apart if not kept cold, but they’d probably be mushy and melty. Probably more of a frosting texture than a truffle. YUM…..I never thought to use avocados in truffles but it makes sense since they are so creamy and delicious. I wonder how many of these I could eat in one sitting? Probably way too many…they look so good! I love sneaking avocado into my chocolate desserts! haven’t tried making truffles with avocado yet, these look amazing and totally healthy and delish! I gotta try these. I seem to have such bad luck buying avocados when I need them, they’re either way too ripe or nowhere near ready and screw up my recipe plans haha I’ve seen some frozen avocado in the freezer though, I should give those a try. What an awesome creation. Trying these soon! Since it’s only healthy ingredients in these, I can eat them all, right?! YUM!!! Totally pinning! I have made Paleo Brownies with Avocado and Cocoa. The recipe suggested the brownies are good for up to 4 days in the fridge. I put mine in the freezer and they can be eaten directly from the freezer. It has been longer than 4 days and I have not gotten sick. However, the longevity of raw mashed avocado is my only real concern with these recipes. The brownies and cake are baked at least. I agree that they taste better after they mellow. Thanks for these recipes to try. Would u say the calorie count is on these I’m looking for something to feed the sugar sweets but not help me gain weight .. This is such a terrific idea!! I’m definitely trying these – pinning now!